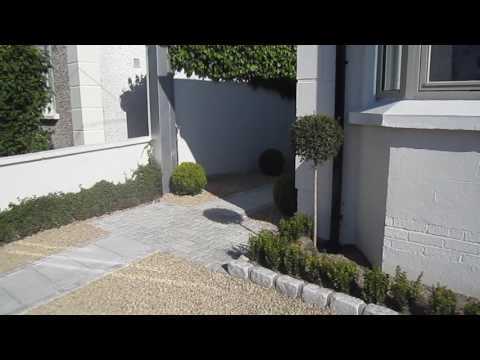 Low Maintenance Garden Design, Clonsilla, Dublin. 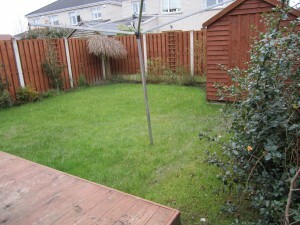 Home / Blog / Low Maintenance Garden Design, Clonsilla, Dublin. 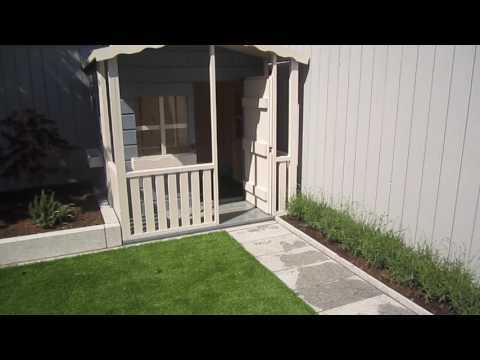 Our landscapers first constructed the Cota brown limestone patio. The area was dug to a depth of 125mm. A layer of 75mm quarry screenings was spread around the the excavation and compacted with a vibrating plate. 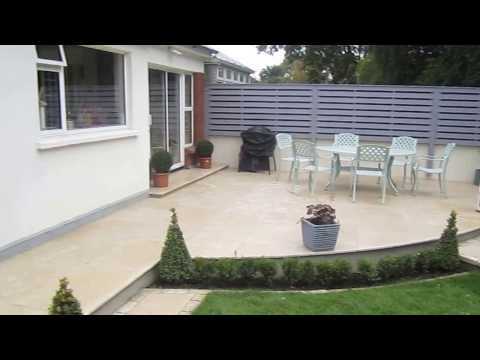 The 600×300 limestone slabs were then laid on a bed 5:1 sand and cement mix. All joints were then pointed with a 3:1 sand and cement mix. 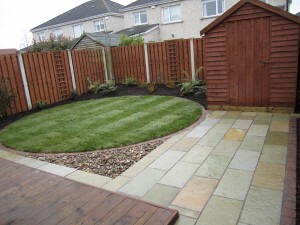 The pointing mix should be wet as this is what strengthens the patio. 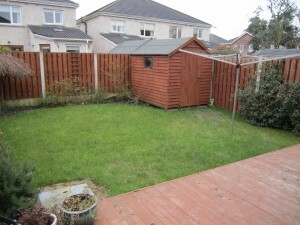 Our landscapers then positioned a post in the centre of the existing lawn. A string was connected to the post and a circle was marked. 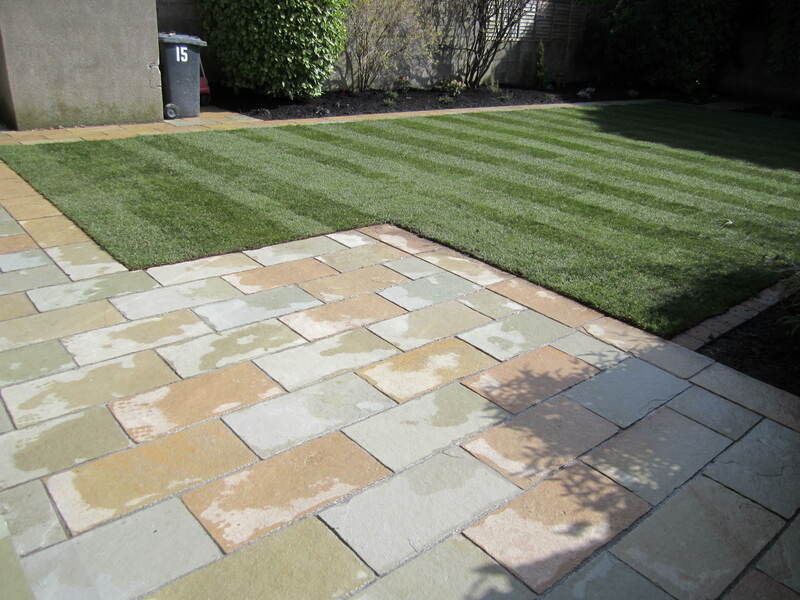 We used 100x100mm Camel dust setts for the outer mowing edge. 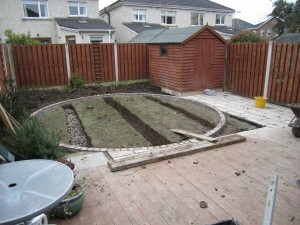 The setts were laid on a bed of 3:1 sand and cement mix and pointed with same. 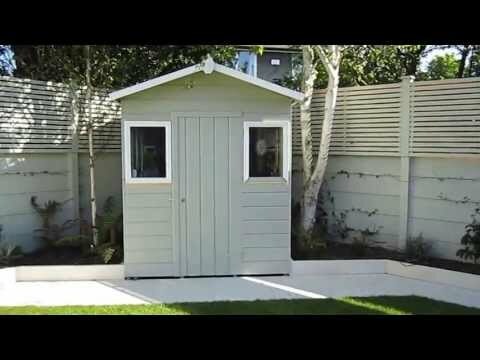 The mowing edge is very important as it ensures a solid edge to the bed and also defines the lawn area from the bed. Our landscapers then set about solving the drainage problem. 4 trenches were dug to a depth of 80cm and 1meter apart. The good soil excavated was re-used in the beds while the bad was carted to dump. Pea gravel was then used to fill each trench by half, covered with geo textile and then filled with screened topsoil, these are called mole drains or soak aways. 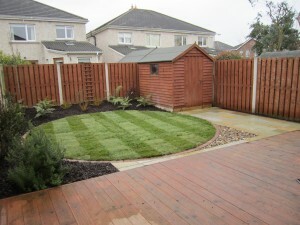 Four tonnes of screened topsoil was then imported to site and used to bring up levels in the lawn and bed areas. 30 meters squared of roll out turf was laid to make up the lawn. The whole area was then tamped using a piece of sleeper connected to a round post. This tamping is very important as it ensures direct contact between the turf and soil beneath. The turf is then well watered and kept well watered for at least 3 weeks when all traffic should be kept off. The beds were then landscaped creating mounds moving away from the mowing edge which gave depth and interest. 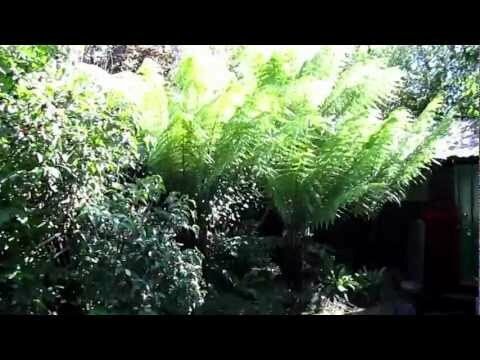 The plants were then planted and consisted of 6x Dicksonia antartica, 3x Libertia, 1x Euonymus alatus, 1x Diosma, 1x Euonymus compactus, 1x Skimmia japonica and 1 Sorbus ‘Autumn Spire’ for height and to attract birds. All the beds were then covered in 75mm bark mulch to keep down weeds and ensure low maintenance going forward. 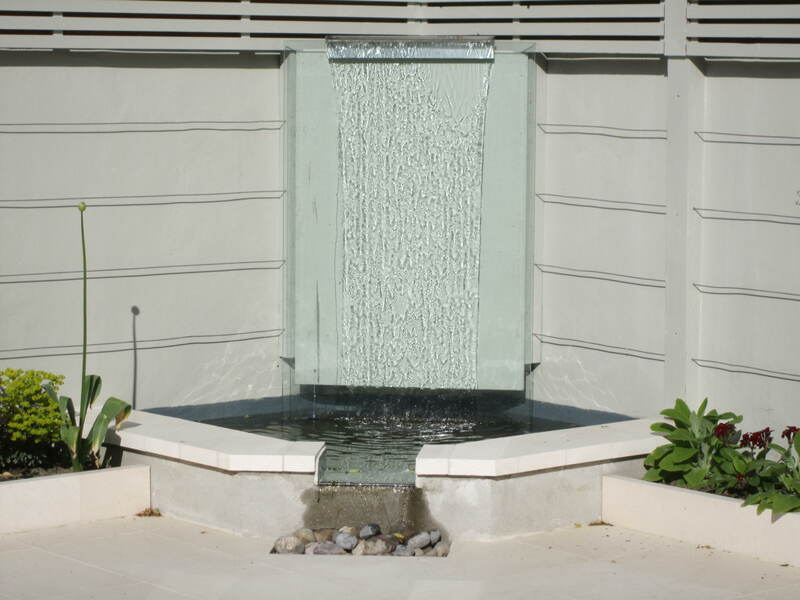 The contract came within budget and the client was very happy with the results. 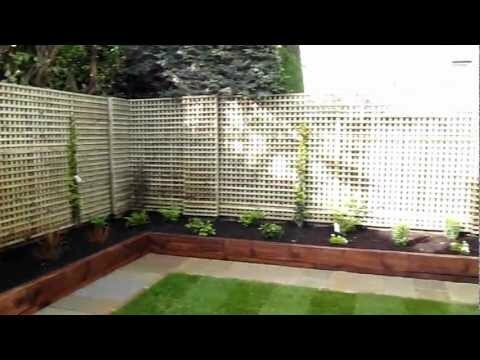 If you like what you see and require a professional garden design and landscaping service contact Kevin Baumann on 086 8198444.